11 a.m. Friday, August 10: Welcome Olive Mediterranean Grill to its new home at 44 E. Third St. The ribbon cutting will take place at 11 a.m. – just in time to get lunch at this Greek and Mediterranean-inspired restaurant. The newest Activated Spaces Pop-Up Shop, Picture Perfect Paint Parties hosted a ribbon-cutting ceremony Wednesday. This new paint-and-sip studio, located in Talbott Tower at 123 N. Ludlow St., invites guests to create their own works of art in a guided class. The business is open for a lunchtime paint break from 11 a.m. to 2 p.m. Tuesdays through Fridays, and is open through 8 p.m. Saturdays and Sundays. The new owners of the Fire Blocks District welcome those invited to a special presentation of the future for this publicly anticipated project at 4 p.m. Friday, August 24, at 124 E. Third St. The event will include visual and performance art, complimentary refreshments, and an inside look at the mixed-use spaces. Please use this link to RSVP. Agape Media recently moved into its new 1,500-square-foot space at 104 Brown St. in the Oregon District. Founder Jason Elam grew up in Dayton and said he never imagined he would stay here until a University of Dayton summer program immersed him in the city’s vibrant and growing creative community. Now he and his company are here to stay. The Agape team provides a variety of services from corporate productions to collaborative promotions for local business and nonprofits. They also capture weddings, music videos, and provide FAA Part 107 certified drone imaging. 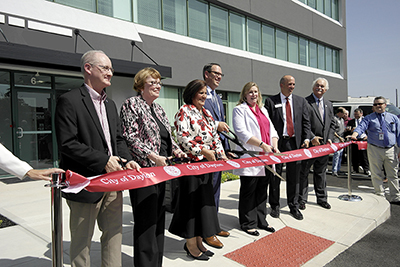 Agape Media used the Downtown Dayton Partnership’s free and confidential Site Seeker program to find a space for the startup. Launch your own company’s search by filling out the application online. The newest purveyor added to the lineup at District Provisions is ready for its official launch. Grist Provisions will offer homemade breads, fresh pasta, and other goods in convenient take-away packaging, perfect for the downtown professional to pick up on the way home from work, or for a quick dinner for a downtown resident. District Provisions is located at 521 Wayne Ave.